On a rough rocky ridge between Earlston, Greenlaw and Kelso stands the odd looking late 18th century folly of Hume castle raised by the Earl of Marchmont, which conceals within it's base the fragments of the original late 13th century courtyard castle enclosing an L-plan towerhouse and it's medieval well. The castle was built for the Home family (later known as Hume) and was attacked on numerous occasions because of it's position on the border. Some of the main assaults being in 1515,1547,1569 and lastly 1651 when it was demolished by Cromwell's artillery under Colonel Fenwick. Hume was the Home family's main fortress protecting the Merse. 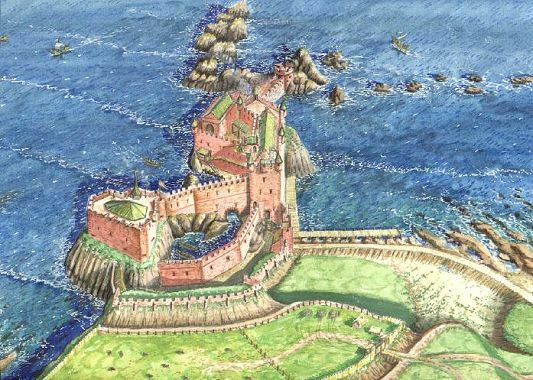 Though branches of their kin also held Thornton castle, near Dunbar, Douglass castle and church, Fast castle and even Coldingham Priory (for a time) all on the eastern march as well as lands in the west including Cowdenknowes. But since there are many Home branches ancestoral connections can be confusing. Some of the main branches were the Homes of Cowdenknowes, of Wedderburn, Manderston, Renton and Kames, Blackadder, Crossrigg and Broomhouse. From the Cowdenknowes line (through John of Earlston) linked to the Douglases, descended Sir Alexander Douglas - Home the famous Foreign Secretary and Prime Minister in 1963.The Homes of Wedderburn led to the 'Humes' of Polworth and Marchmont, Sir Patrick being made Lord Polworth in 1690,later Earl of Marchmont and Chancellor of Scotland in 1697.From the Manderston Homes descended George Home of Spott who became Earl of Dunbar in 1605. The Home family were anciently descended from William the son of Gospatrick Earl of Dunbar and March, though they changed their name to Home after their estate on the Merse. 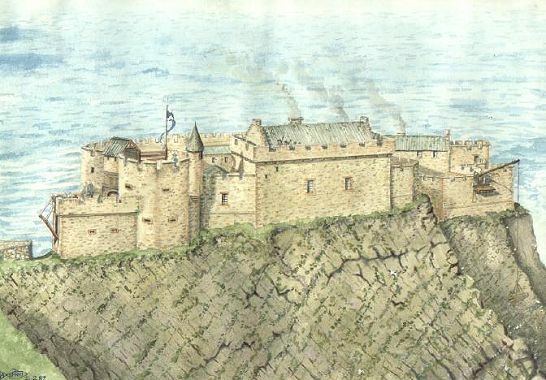 Interestingly the Gospatricks of Dunbar castle also changed their name to Dunbar after their main castle seat and estate. It was not unusual for families to name themselves after their lands. For example the Douglas family's Flemmish ancestors took their name from the dark water or 'dubh-ghlase' where they first settled beside in the west of Scotland. In 1400 the Dunbars sided with the English resulting in them facing their old kin the Homes at the battle of Homildon Hill near Wooler in 1402,where the Scots were defeated by 'Hotspur' Percy's Welsh archers. Even after the Dunbars returned to the Scots side in 1409 the Homes continued to conspire against them by siding with the Dunbar's rivals the 'Black' Earls of Douglas. In 1424 Alexander Home died at the battle of Verneuil in France with his master Archibald 4th Earl of Douglas. In 1433 the Homes turned Coldingham Priory into a fortified camp ousting William the 'Red' Douglas from being 'Protector' there (the 'Red' Douglas being an enemy of the 'Black'). 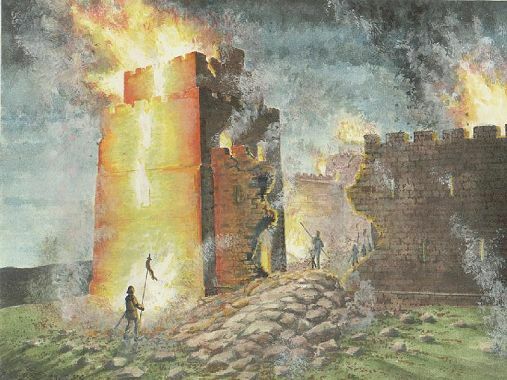 He was prevented from attacking the Priory by King James I (1406-1437)as it was an English monastic cell and such an attack would give the English an excuse to invade. So the Douglas could do nothing to the Homes. 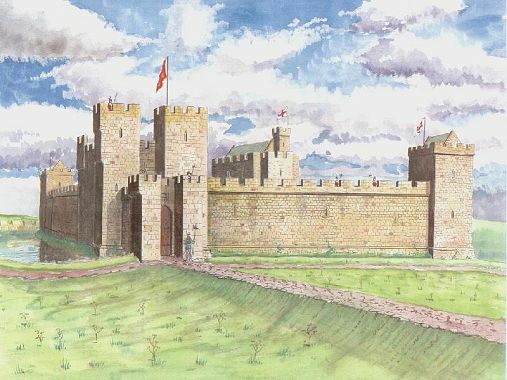 In 1460 King James II's (1437-1460) wife and son Prince James (later James III 1460 - 1488) stayed at Hume castle while he attempted to bombard Roxburgh castle (then held by the English) into submission. Unfortunately one of his cannons the 'Lion' (which may have been tampered with) exploded killing him and wounding his ally George the 'Red' Douglas 4th Earl of Angus. The Queen and young Prince rushed to the siege to encourage the Scots army on to complete the siege in the King's memory. The Douglas was well enough several days later to crown James King at Kelso Abbey. With their new boy King the Scots stormed Roxburgh and cast it down. In 1473 Sir Alexander Home was raised to the peerage by King James III. Later though in 1488 he sided with the rebel Lords of Douglas, Hepburn, Hamilton and Halyburton at the battle of Sauchieburn, near Stirling resulting in the King's murder. The rebel Lords had used young Prince James (later James IV 1488 - 1513) as a figurehead, though he never expected his father to be killed. Legend claims that King James IV was so grieved by his father's death that he picked up a horse's bridle and fastened it round his waist against his bare skin so that it chafed him as a reminder and penance for his Father's murder. There is a mention of "one link for the King's chain" in James's accounts in later life which gives substance to the chain legend. As with all men over the age of 25 his waist had suddenly expanded so a link had to be inserted to accommodate his wider frame. In 1513 James IV invaded England taking the castles of Wark, Norham, Etal and Ford. 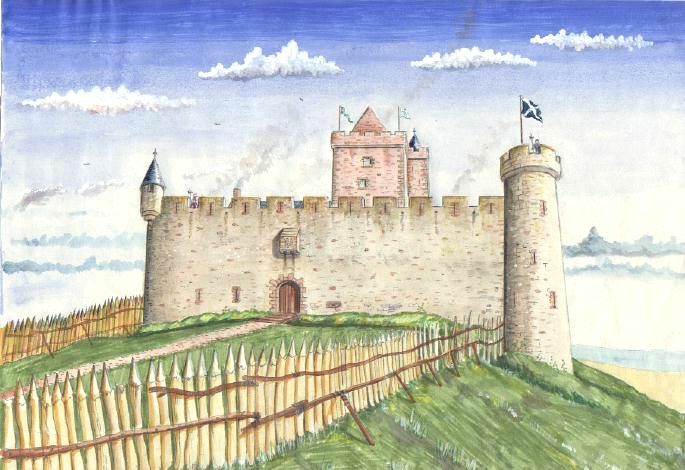 Instead of pressing on with his invasion James spent several days dallying with Lady Heron of Ford castle (which allowed the English time to mass their forces at Alnwick and Newcastle). The King's actions angered his noblemen as for the Scots army to sit idle at Flodden field was strategically unsound and several units began to drift home. Having finished with Lady Heron James burnt down her castle and moved on to join his men at Flodden. As the English forces appeared marching round the Scots position, Lord Lyndsay requested permission to lead his horsemen in a charge to scatter the English. James refused as such an action was unchivalrous and insisted Lyndsay hold his ground or be hung for insubordination. Lord Borthwick (the King's cannon commander) pleaded with James for an opportunity to fire on the English while they were dragging their own cannons into position. Yet James dismissed the sound advice of his men and insisted Borthwick fire a salute to welcome the English to the field. Interestingly the salute was taken by the English to be incompetence as they thought the Scots gunners were unable to gauge their position. Once both sides were ready a brief cannon exchange ensued in which the Scots came off worst. The Homes who could not tolerate the farce of James's leadership any longer charged down the hillside with their horsemen and men at arms close behind scattering the English right rank into chaos. At this point a border fable claims the Homes who cried a "A Home, A Home" as they charged into battle was misconstrued by their men to mean go home. So once they broke through the English lines they fled home. Hence their name was changed to a Hume so as to save any future mistakes!!! Instead of trying to emulate the Homes mounted charge, James squabbled with his nobles demanding that they dismount and fight on foot with his pikemen. During this time the English right wing regrouped. As the Scots charged ,the English billmen hooked the heads off their pikes effectively leaving the Scots holding broom handels. With drawn swords and dirks they continued to fight but were torn to pieces by the English bills. James was also slain but the English had problems finding his body. Since James prior to the Scots charge had ripped off his Royal surcoat to show his nobles that he was prepared to fight as an ordinary man at arms. Also the body later recovered by the English claimed to be the King ,didn't have a chain round it's waist. So some historians claimed he removed his chain while dallying in Lady Heron's bedroom. However, an ancient border poem claimed that during the battle of Flodden four Home horsemen swept the field snatching up the King's body as such a prize could not be allowed to fall into English hands after such a humiliating defeat. This for many years was dismissed as a border fable. But in the 1800's when the medieval well of Hume castle was being cleared the skeleton of a man with a chain round his waist was discovered in a side cave, could this be King James? Unfortunately this skeleton has since disappeared and is not able to undergo modern DNA testing. So Hume castle was not only a "home of the Humes" it may well have been the tomb of a King.